Have you ever walked into the bathroom, needing to go kind of badly, only to realize that your toilet paper has all been unrolled into a giant pile, shredded, and drooled on by your cat? Why Do Cats Love to Mess with Toilet Paper? Cats are hunters, so they find it hard to resist something that's fluttering around in the air, like the end of the toilet paper roll. Attacking it naturally leads to its unrolling, which creates more and more fun. 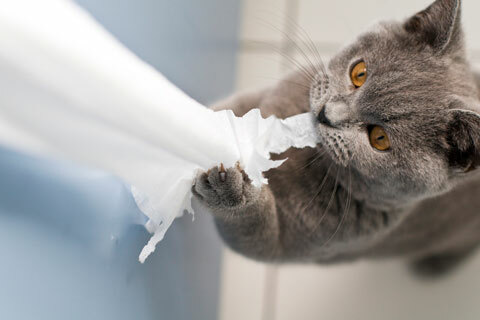 Your cat might be obsessed with the toilet paper because she doesn't have enough other opportunities to exercise her hunter instincts, because she gets bored while you're doing other things during the day or sleeping at night, or simply because she's learned that it's pretty fun. How Can You Keep Your Toilet Paper Safe? The odds are that you don't want to have to waste money on extra toilet paper every week or spend an hour a day cleaning up tiny bits of shredded toilet paper from all over the place. Keep the bathroom door closed, so your cat doesn't have the opportunity to get to the toilet paper. Use a cat guard on your toilet paper roll to protect it from your cat. Give your cat lots of interactive playtime so she can exercise her hunter instincts in a way that doesn't make a mess or waste toilet paper. 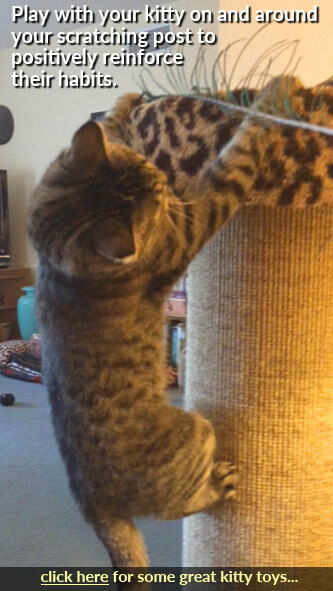 Wand toys provide a wonderful way for cats to act like predators and get out physical and emotional energy. They are only for supervised use, so they provide good bonding time for you and your cat, too. Provide food puzzle toys or automatic prey-mimicking toys when you're not around, to keep your cat busy and her attention off the enticing toilet paper roll. Hide your cat's daily kibble around the house. Breaking up your cat's daily dose of kibble and hiding it in different areas around the home allows your cat to "hunt" and keeps her busy and exercised. Even if you're not too bothered by your cat's toilet paper antics, it's probably a good idea to do what you can to curb them. If your cat were to actually ingest large amounts of toilet paper, which isn't common but is possible, it could become a medical problem.